That’s an ominous title, isn’t it? No good can come from a title like that. I hate to admit it, but I don’t remember this scene at all. 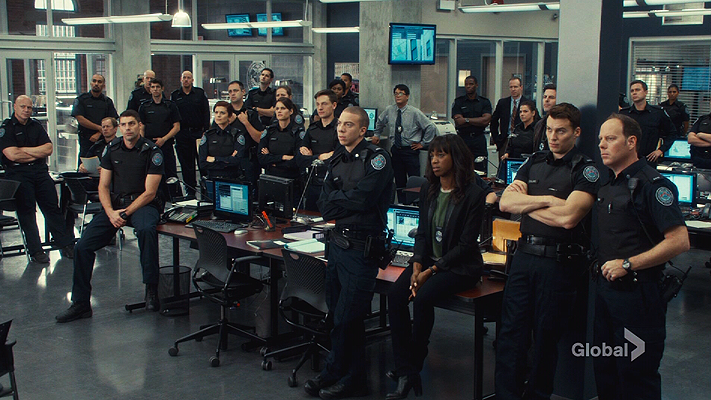 But the biggest amount of kudos I can muster goes to the Rookie Blue writers for some seriously stellar continuity. However, the whole "breaking up the band" thing hasn’t come to fruition yet, so maybe we should wait and see if our celebration is short-lived or not. It would be bad enough to have just one character leave the team (I’ll get to that later), let alone have the team split up beyond repair. Either Jarvis or Jarvis’ bosses need to have a change of heart, or we’re likely looking at some major changes. Since that was only mentioned this week, we might see it carried out in the season finale. Duncan handled this whole blow-up with his stepfather in the opposite way that Gail is handling things with her brother. He doesn’t want to be associated with Santana, and he makes it clear. Instead, he’s happy, he’s helping out, and he’s gaining the respect of those around him. He's moving on. It’s just a really interesting parallel between the characters, their different circumstances, and how they’re handling it all. Duncan’s not going to stop being the little kid of the group any time soon, but this storyline has forced him into major character growth we’ve been waiting a long time for. Gail had a huge decision to make in this episode: lie and say she was with her brother at the time of the bombing, or send him to prison (where he likely would have a very rough time). It didn’t help that her father was pressuring her to lie and fed her what she was supposed to say. For those of you keeping count at home, Gail lying would mean that BOTH Peck siblings would then have committed crimes. And for the bitter cherry on top, Gail missed her meeting with the adoption agency and got to hear about the nice couple who also wants to adopt Sophie. It was so interesting how they didn’t let Gail make a decision. She wasn’t caving in and telling the story her father wanted her to, but she wasn’t sealing her brother’s fate, either. I think it was important for Steve to actually confess and own up to his crimes, but what Gail’s decision would’ve ultimately been will be one of the great Rookie Blue mysteries. Gail didn’t know the answer herself. Juliet’s advice about being able to still see yourself in the mirror made Gail think about her own actions and conscience. She admits that she doesn’t know what her indecisiveness says about the kind of person she is. So she asks about the other couple and realizes they’ll be a wonderful fit for Sophie. Then she cries. In the middle of the Black Penny, in front of the adoption agent. How many times have we seen Gail cry over the past six years? It was just such a raw moment and the way they tackled that moral issue was extremely well done. In case I don’t get around to this next week, I want to pause here for a moment. This season, the writers took Chris, who had been on a pretty rough track and whose storyline had been a thorn in my side, and turned him completely around. 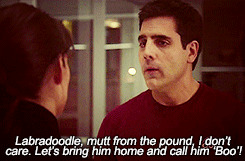 He was there for Gail multiple times this episode, and I just love the two of them. It hasn’t mattered whether they were a couple or best friends – they have this dynamic that stands out above everything else. Gail knocks sense into him, and he helps bring out the light in her. And this wouldn’t be the case once again if the show hadn’t evolved his character. He didn’t have much to do in this episode, except failing at giving Sam relationship advice and actively rooting for Andy/Sam and Nick/Juliet. He also came up with duo names for Andy and Dov (McStien) and Chris and Chloe (Dice). That scene alone made up for his lack of screentime in this episode. When they realized the guy who ran the music festival was the one who framed the band, Chloe was in the office/trailer with him. The door burst into flames in a crazy-good action sequence. Chloe and the guy were inside, with Andy, Dov, and Chris outside. They call the fire department and Chris runs for the extinguisher... but it’s not working fast enough. So Dov runs THROUGH THE FIRE, kicks down the door, RUNS THROUGH MORE FIRE, and finds Chloe unconscious inside. There was so much emotion in this scene and it was one of my absolute favorites of the night. While this episode hadn’t even addressed the two of them as being a couple again, this pretty much set it in stone (for me, at least). Chloe almost died again, and this time Dov was able to help her. I’m going to be back to not liking Juliet again if she’s the reason Nick leaves town. Look, I think we all knew Andy wasn’t going to Vancouver when Juliet offered her the undercover job. But Nick going is something the show could feasibly do and I don’t like it. Yes, Nick’s not in a relationship at this point. Neither are Chris, or Duncan, or Gail for that matter. Nick doesn’t need to be paired up with someone. He took Andy breaking up with him without fighting it, even though it clearly pained him. And he's been there for her ever since. He should find a happy ending with someone eventually. It just doesn’t have to be on the other side of the continent. This isn’t the first time Andy has had the chance to run away from her problems. She and Nick got into that car at the end of season three in order to embark on an undercover operation without letting anyone else know. This time though, Andy didn’t leave. Here’s the thing: Sam has always been the one who most needed to become better at communicating and working through problems. HE was the one to shut down. We can’t forget, however, that Andy’s always been the one to run. Like when Sam first told her the news about Marlo, she walked away from him. She needed space. And it’s perfectly fine to need space and to process. It can actually be really healthy to take a time-out from life and relationships, step back to see the bigger picture, and remove yourself from drama. Andy shouldn’t have to always deal with this drama, and if it gets to be too much, she deserves some space. But there’s stepping back and then there’s avoidance. Andy says to Juliet: "I wish I could fast forward through all this." But she can’t. You can’t run away and tell yourself that time will make everything that was once difficult, better. Andy is lying to herself. She’s scared, and she has every right to be. But being scared isn’t a free pass to flee. The wonderful thing is that Andy DID consider leaving and actively chose not to. Sure, she "only told [him] about the offer to give [him] an out," but she considered it all the same. At this point, Marlo had already stepped out on a serious limb and talked to her. She apologized for what had happened the night before, and they had a heart-to-heart about everything on a very low-key level (although I suppose you can’t start shouting when there’s a sleeping baby in the room). I think she realized that they’re ALL trying to figure their situation and their drama out. Andy was in a slightly better place when she went to talk with Sam, but she started off the conversation by yelling at him anyway. Whether she realized it or not, what she was really doing here was pushing him away in order to see what he’d do in response. Okay, so at the start of the episode, Sam wasn't reacting so well. But even then, he was being open and truthful about how he felt. In the last scene, he freely expressed his emotions, his perspective, and how much he has changed because of Andy. He didn’t shut down emotionally. He didn’t walk away. The aforementioned puppy also chose this moment to enter the scene, and it was... well, honestly, it was perfect. Next week marks the final episode of season six, titled "74 Epiphanies," and it’s going to be one landmark one. Cross your fingers for a seventh season, and savor this next episode like the cornerstone of the series it’s destined to be either way. And thank you all for reading my reviews so far! I’ve had a blast, and it’s been a thrill and honor to know you guys take the time to read these. Until next time. Sam did laps around the block to keep the "Little Frog" happy. I think he’s doing this father thing right. Gail: "What does this outfit say to you?" Chris: "I’m wearing clothes?" "I hate to admit this, but I really don’t know what I would do without you." - Gail to Chris. These two are the best. Oliver: "McStein… Dice." *perplexed officers* "Not every one of these names can be winners." A nice wink to the fandom, right there. And no one better to do it than Oliver. "Yeah, that extra half-a-sugar really makes all the difference." Hope’s Unedited Notes returns with this: "AH, the vending machine, you poor cursed creature destined to be a makeshift punching bag." Oliver is such a shipper. Not always a helpful one, but one nonetheless. Juliet: "[Steve] put himself here." Gail: "Juliet, how’s my ex doing?" Eeek, Gail’s bristly side really came out in this episode. It was awesome. Chloe: "Hey dummy… Basic rules of criming!" Duncan: "I messed up so much since being here." Traci: "You’re nothing like him. You’re a good cop." Duncan: "Wow. No one’s ever said that to me before." *beams* Hard-earned. But deserved. Chloe: "What took you so long?" Dov ran through fire to save her, and this is the first thing she says. Yep, they’re perfect. "I can live with myself. I can look in the mirror and still see me. Sometimes that’s all you can hope for." I don’t know how Chris ended up at the courthouse, offering to give Gail a ride. He just appeared like a guardian angel. "How did you know this was my car?" "I didn’t. This is the fourth one I’ve pulled over." Okay, so Nick chasing Juliet down in the squad car was an wonderful gesture. Still doesn’t mean he has permission to go to Vancouver. "The only reason I ever thought I could be a dad was because of you… you changed me." "I don’t know how to say that to you without feeling like I’m making you choose between me and your family." "Let’s please try the one thing we haven’t." The dialogue leading up to this was too long for me to copy down in time, but it was beautiful. It summed up their relationship over the entire series. "Do whatever you want. We’re all yours."